When I took this step forward, back to film, I wanted something more than what I could get from 35mm. 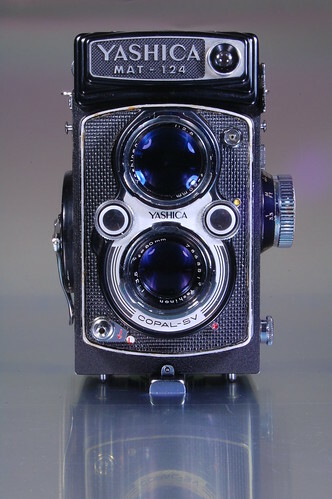 So I started looking at medium format cameras. 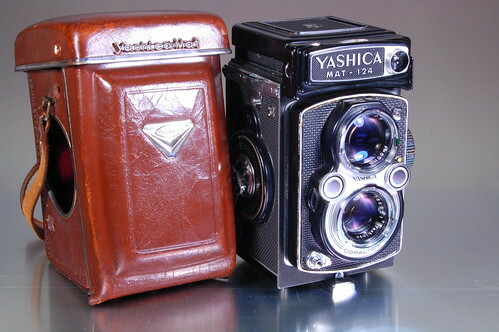 The Yashica Mat-124 was one of the first medium format cameras that I got, a birthday present from my wife. 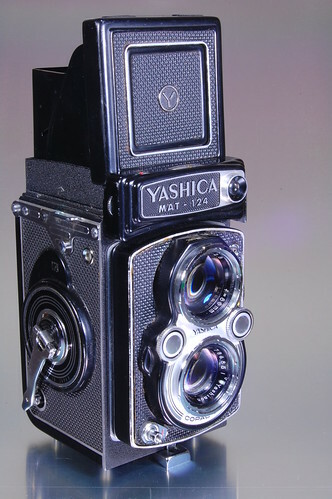 The Yashica Mat-124 is a twin lens reflex (TLR) waist level finder medium format camera. 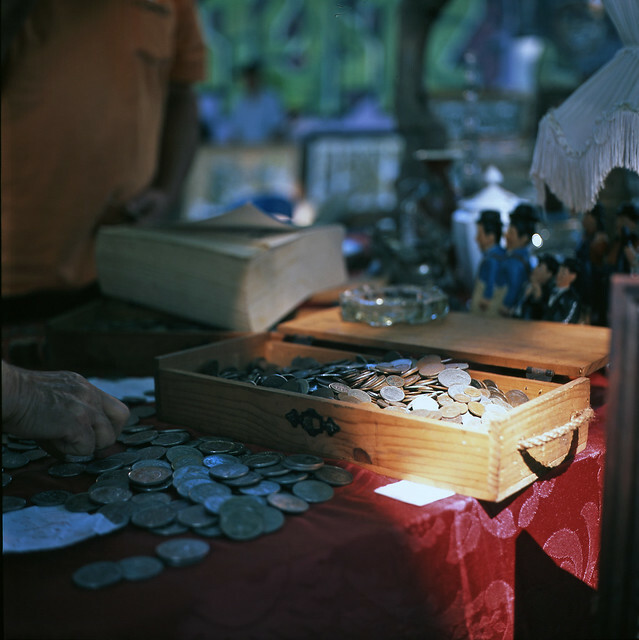 This is a Rolleiflex clone, maybe the optics are not in the same league, but I’m very pleased with the results that the four elements in three groups, 80mm 1:3.5, Yashinon lens delivers. In the lens-board it has the viewing, top, and taking, bottom, lenses. 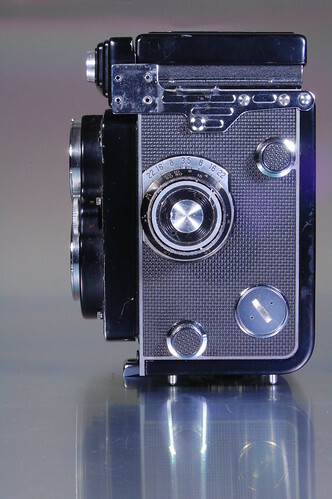 The shutter speed and aperture controls, round dials on each side of the lenses. The flash socket, top right and flash synchronizer lever, the yellow dot behind the aperture control dial. The red dot, at five o’clock of the taking lens is the delayed shutter release lever. On the bottom left there is the shutter release and lock lever, in lock position. Above the lens-board, to the right of the embossed brand and model, that round “eye” is the window of the CdS light meter, powered by a defunct PX625 mercury battery. I solved the problem, in this and other cameras with an adapter to zinc-air batteries, used in hearing aid devices. That big round knob is the focus control, turning it makes the lens-board go back or forth allowing the user to control the focus on the ground glass. 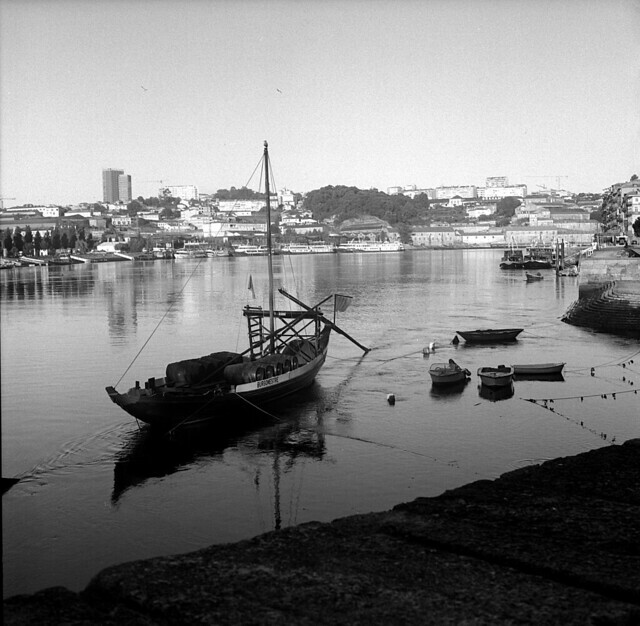 On this kind of cameras the focus achieved in the ground glass is the same of the taking lens, at full aperture, due to the solidary movement of the lenses. One has to be careful with the parallax error, at close range, caused by the distance between the lenses. The distance scale is engraved on the outer rim opposite the depth of field scale engraved on the chrome plate. The two smaller knobs, top right and bottom left are the spool locking knobs. On the bottom right is the battery compartment with its chrome lid. Probably you have already noticed something missing on the top left. I removed the accessory shoe, for two reasons: one, I don’t plan to use a flash with this camera and two, the camera doesn’t fit the case with it on place. The big film wind crank, that doubles its function cocking the shutter, dominates the scene on this side. When its winded all the way clockwise it winds the film to the next exposure. Winding it back, CCW, it sets the shutter. I love that “taka-taka-taka…” sound. 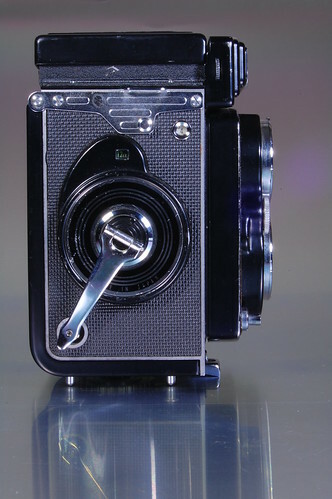 The window over the crank shows the type of film being used 12ex (120) or 24ex (220). The window on the top right shows the number of exposures taken. 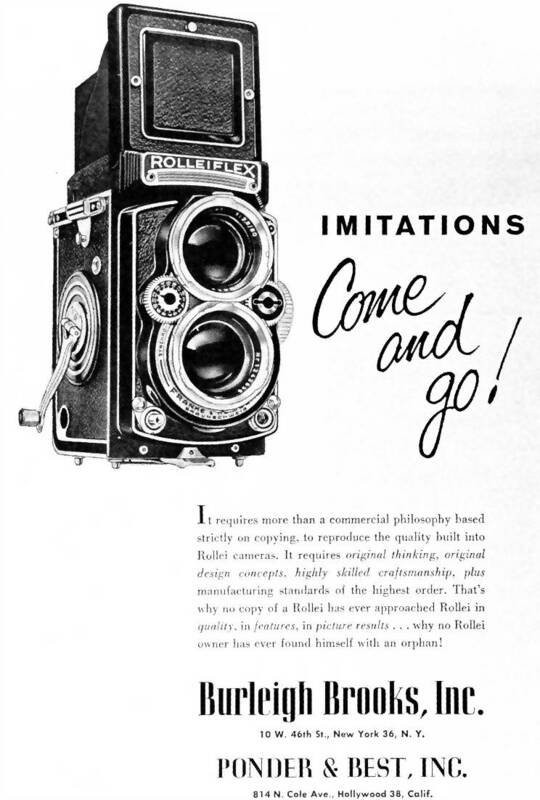 The loading process of the rollfilm avoids the use of a red window by aligning the start marking of the film with an arrow on the film path, in the camera. From there all we have to do is wind the film to the next frame. You can see it with the hood opened, ready for action, inside it there is a 3x loupe, that can be flipped up, for critical focusing. There is also this sports finder, for fast action photography. It’s a great asset, you know what I mean if you ever used a waist level finder camera before. In the finder one gets a left-right inverted image, that can be puzzling if you’re not used to it and are trying to follow a moving subject. The light meter is quite accurate but gives a too wide reading. For critical readings demands for proximity or ingenuity. This is a very nice and usable camera, if you don’t mind to be stopped by people on the street that want to admire your camera, and also if you don’t bother to carry more than a kilogram worth of camera. Delayed timer; M or X flash synchronizer selector. 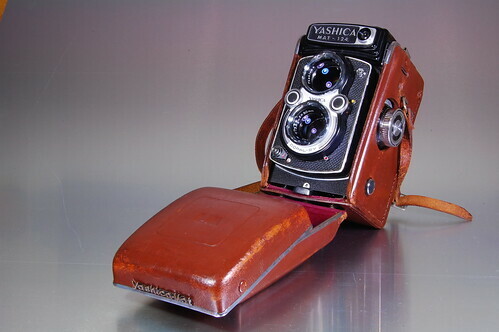 Finder: YASHINON 80 mm 1:2.8 viewing lens. Fresnel field lens for corner to-corner brightness, 3X magnifying lens for critical focusing. Automatic resetting exposure counter displays the number of exposed frames. Distance scale calibrated in both feet and meters (3.3 ft to infinity; 1 m to infinity). Other features: Aperture scale from F3,5 to F32. Bay-1 filter mount (Rollei compatible) for 30 mm filters. If you are reading this, you already know photography is an expensive hobby. We spend thousands of dollars on the equipment we need for capturing the light at that decisive moment. But you can get started at this nature photography habit without selling your car. Most people start with a simple 35mm rig, then build a few lenses and accessories around whichever system they have chosen. See“What Camera Should I Buy?” on this forum for more information. So how do you get started on the cheap? Check out the photo.net classifieds or other web sites. One good source of information, which I discovered through photo.net, is the Medium Format Digest.Reading the postings of people who used Yashica Mat 124G cameras prompted me to add this to my short list of necessary equipment. 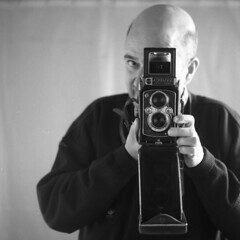 I wanted a larger original than my Canon EOS system gave me, but could not afford to lay out several thousand dollars for a Bronica, Hassleblad, Pentax or Rollei. When I found an excellent Yashica Mat at Adolph Gasser’s in San Francisco a few months ago I decided to take the plunge. One roll of Ektachrome 100SW later I was hooked. But this was just a test roll shot in a local park, to make sure the shutter speeds and apertures were working. The true test would come two weeks later on a trip to the Sierra Nevada Mountains. Still being uncomfortable spending the money for slide film for such an old camera, I brought the EOS along to shoot Ektachrome and loaded the Yashica Mat with Kodak Ektar 25. My son and I spent a long weekend near Kennedy Meadow, taking scenic photos along Highway 108, where it parallels Deadman Creek, and up to Sonora Pass. Looking down at the ground glass, and interpreting a reversed image, helped me concentrate more on composition than I did when peering through the tiny viewfinder of my Elan II. The Yashica Mat does not have a bright viewfinder image, especially when compared with a Rollei TLR, but I found that by flipping up the magnifier I could easily compose and focus even in low light. I shot one entire roll using some rocks in the foreground to test the corner sharpness, with water rushing over rocks in the middle and upper portions of the image for visual impact. When I went to the lab a few days later I was pleased to see the rocks in the lower corners were indeed sharp. And the complete lack of grain and added tonal scale made 35mm enlargements look, well, grainy and dull. The next test came on a trip to the Bristlecone Pine National Forest, just north of Death Valley in California’s White Mountains, and Great Basin National Park in eastern Nevada. I carried both systems again, but this time brought slide film for the Yashica Mat and Kodak Royal Gold 25 for the Canon. 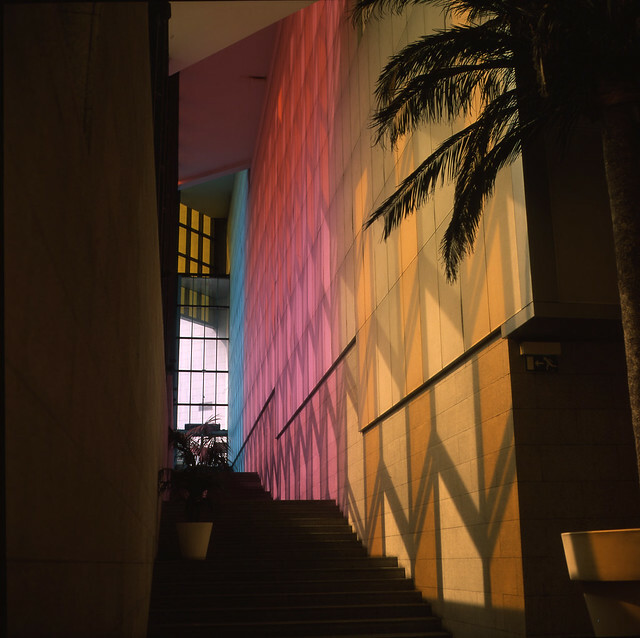 The slides were a mixture of Fujichrome Velvia, and Agfachrome RSX 50, 100 and 200. A friend who shoots fashion photography sent me six rolls of the Agfachrome to test. You gotta love being someone else’s guinea pig. I followed my usual procedure on this trip, dragging my son around all afternoon, searching for interesting scenes and checking my compass to make sure the morning light would shine on the particular tree I spied. When my alarm went off at 4 a.m., I crawled out of my sleeping into the cold morning, left my son sleeping in his tent and drove back to the target tree to wait for sunrise. Because I hadn’t bought a light meter, I used to Elan II to meter the light, mounted the Yashica Mat on my tripod and shot a few frames at first light, then mounted the Elan II and shot a few more frames, just in case. I waited a bit for stronger light, but another tree started casting a shadow on my tree of choice, so I moved in closer and took some close-up shots on the twisted tree trunk. These came out especially well. 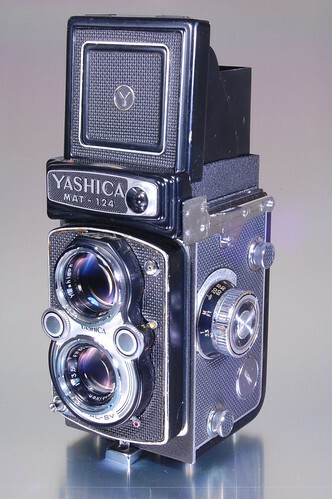 By the way, the Yashica Mat 124G does have a light meter. However, I have found the meter in the Canon EOS Elan II is extremely accurate, and the meter in my Yashica Mat reads two stops slower than the Elan II meter. Using the Elan II as a light meter is tedious unless I have both cameras loaded with the same speed film, but it does work very well when I keep my mind on what I’m doing. That is not always easy with an 11-year-old along asking me to check the framing in his Konica point and shoot all the time. After a few days in the Bristlecone Pine Forest, we headed east across Nevada to Great Basin National Park. (Tip: get there in the fall after the aspens have changed color. I plan to go back.) Four days in Great Basin yielded excellent shots with both systems, but a few with the Yashica turned out just as I had envisioned. My son decided to accompany me on one early morning shoot the second day in Great Basin. We hiked up to Teresa Lake before sunrise, and waited. Snow-covered Wheeler Peak reflected in the almost calm water, ruffled only by a slight breeze. I shot a few 28mm frames with the Canon so I could get the reflection and the peak on the negative, then switched to the Yashica Mat. The 80mm lens couldn’t get the whole scene in the viewfinder, so I moved a little closer, focused on rocks under the water and stopped down to f/32 to get the reflection sharp. These are some of the best shots of the trip. Sometimes having limited equipment forces you to look for different perspectives. Limitation or advantage? Depends on your attitude. Upon returning to California Monday afternoon, weather prevented us from our planned backpacking excursion into the Ansel Adams Wilderness south of Yosemite National Park. (We were not prepared for snow in July. ), so we headed back to the Bristlecone Pine National Forest. The snow in the Sierras turned to rain 30 miles across the Owens Valley in the White Mountains. We grabbed what little sun there was to try and capture the wet bristlecone pines, but there wasn’t enough light to get many images. On Thursday the clouds broke, and we got some excellent shots with beautiful, fluffy clouds in the sky. Again, I shot both systems on almost every scene. Because Bay 1 filters are hard to find these days, I held a circular polarizer over the Yashica Mat’s taking lens, making sure to orient it the same way as the polarizer over the Canon lens, so my light reading would be similar. How did this work? Quite well. The only difficulty came from trying to remember to calculate the differences between the film speeds in the Canon and the Yashica Mat, and the three frames I blew when I metered with the polarizer on the Canon and forgot to put the polarizer over the Yashica Mat. That’s why I have a used light meter on the way. Oh well, at least it wasn’t 4×5 film. How do the images compare? The Yashica Mat seems to be as sharp and contrasty as the Canon 50/1.8 prime lens, and noticeably sharper than the Tamron 28-200 zoom my wife insisted I buy. These aren’t scientific measurements (I’ll leave that to Bob, if he ever wants to do some), but impressions gained from comparing slides through an 8x loupe. The larger original image size is a decided advantage when enlarging, but the Canon is much more versatile with its excellent range of interchangeable lenses. Looking over the images after returning home, I concluded the image quality in medium format is definitely better than 35mm. And in some instances not being able to change lenses made me think more about how to shoot a scene, and I got better photos than I would have with interchangeable lenses. In other instances, putting a wider or longer lens on the Canon allowed me to change the perspective to a more pleasing composition. This is all part of the process of learning to shoot landscapes, and gives me more motivation to buy a medium format or large format system with interchangeable lenses, give the Canon and the Tamron to my wife and let my son have the Yashica Mat. First, though, I’m getting a good, used light meter. The Yashica Mat gave me some very good slides in both locations, including some beautiful evening images of Wheeler Peak above Stella Lake in Great Basin. Close ups of the bristlecone pines show much more detail in the larger format. But the best image of the trip came out of the Canon, using that cheap zoom at its 28mm setting. It’s one I shot the first day, of a lone bristlecone pine against some red clouds at first light, with the snow-covered Sierra Nevadas in the background. The Yashica Mat hasn’t been perfect. I started having problems with it during the trip.About every other roll the camera would not advance past the first frame until I double exposed that frame, the it would behave. Gasser’s has the camera in their shop as I write this, repairing it under their 90-day used equipment warranty. I’ll update this article after they return the camera. Overall, though, this is a good entry-level medium format setup. With a little research and patience, you can find an excellent Yashica Mat 124G for $150 to $300, a light meter for $50 or so (unless you want to go ahead a get a new one), and a used tripod for $50. Total investment, for me, is about $400 including the camera, light meter and tripod. This will get me by until I can start building a better system. It’s cheap, the image quality is very good, and the weight is low.